The Frequently Asked Questions have been consolidated and moved to the NCLOR. The questions are now individual resources within a FAQ collection. To begin using the FAQ bank, click on “View Question Bank” link below. The FAQs have been organized into categories and topics. You can click a category from the list to filter the questions within the selected category and to reveal the categories topic list. You can click on the question title to view all information about the selected question. Some questions have additional resources attached in the “Links to resources” area of the questions summary page. These resources will give you more information about question. You can also begin to type a question in the NCLOR’s search field to find related questions in the bank. 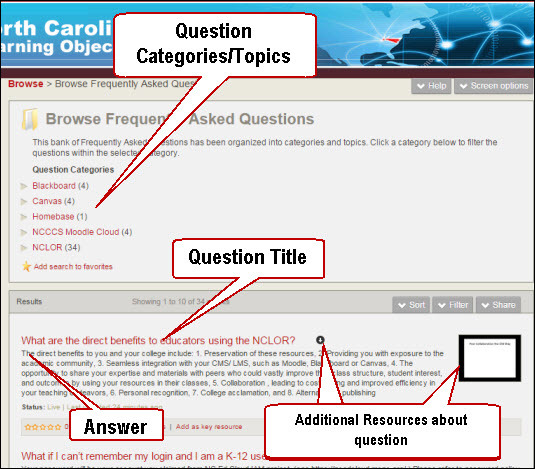 Screenshot of Question Bank Layout with Categories/Topics, Question Title, Answer and Additional Resources areas highlighted.